Check out the latest news stories and featured reviews about Andy Niekamp and Outdoor Adventure Connection. Fill your "passport" with stickers from beautiful parks. Muddy spring hike? Go through the puddles, not around them. 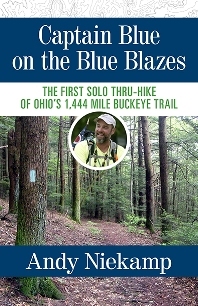 From Hiker to Author: Captain Blue on the Blue Blazes. Sorry these outdoor adventures are just for the ladies. Experts share tips for staying safe during outdoor activities. Google launches Five Rivers MetroParks street view images. Google Launches Interactive Street View Images of Dayton's Trails and Landscapes. Outdoor Capital of the Midwest Going INTERNATIONAL. Trekking the Dayton, Ohio region’s trails with Google technology. Are you game for the Warrior 150 Challenge? Hike Leaders Lead By Example. Andy Niekamp is a Trailblazer On and Off the Trail. 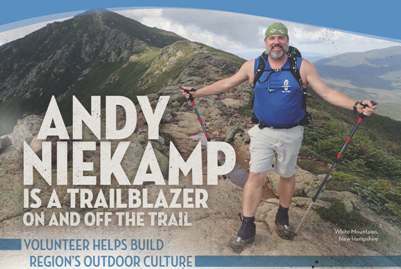 Andy "Captain Blue" Niekamp Gets Mentioned In Backpacker Magazine. Helping Santa fill the wish list for outdoor enthusiasts. Award-winning hiker to speak at YWCA. Hiker to give presentation in Minster. Dayton's "Captain Blue" completes milestone Appalachian Trail. Long distance hiker to share experiences on famous trail. Dayton Hikers founder completes fourth 2,189-mile trek along Appalachian Trail. Local man realizes greatest achievement. Dayton Hikers Weigh In On Best Places To Enjoy Fall Colors. Twin Valley Trail gives backpackers a chance to experience the backcountry close to home. Our client writes about why she loves backpacking. 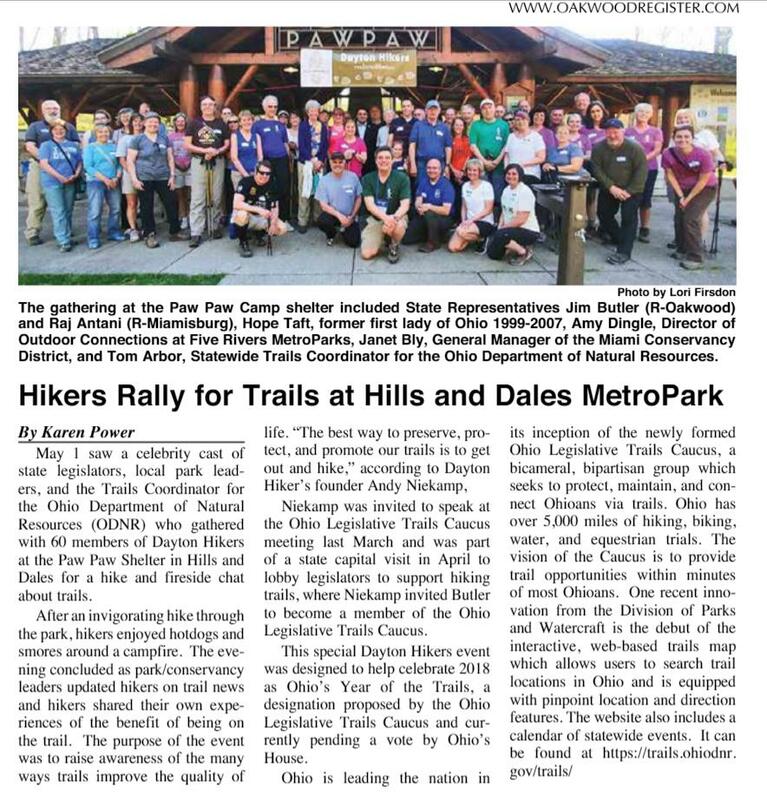 A story about Andy's Buckeye Trail thru hike was chosen to be included in 2016 Official Ohio Travel Guide. View It Here. These gift ideas are surefire hits for the outdoor set. Take a hike! Seriously, it is good for you. Trip Report - Backpacking Workshop. 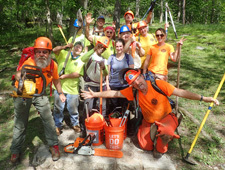 AmeriCorps Team Works at Two Kentucky State Parks. 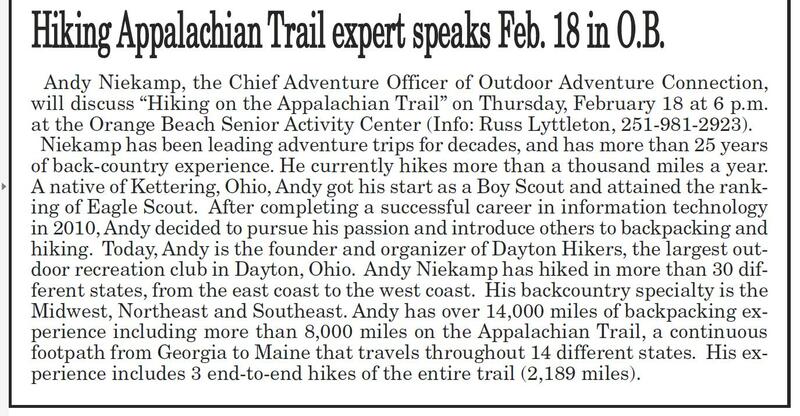 Carter Caves State Resort Park will host adventurer Andy Niekamp in April for three presentations about trails, hiking and the outdoors. Inspiration, information and recreation at Adventure Summit. Resolution tips from local fitness experts. Trail Town distinction does to Dayton. Get active at Midwest Outdoor Experience. Mad River Bikeway now connects to WPAFB. Dayton Hikers - First Annual TVT hiker challenge. Hitting the Trail. 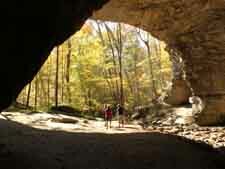 Backpacking for beginners set March 23-24 at Carter Caves.